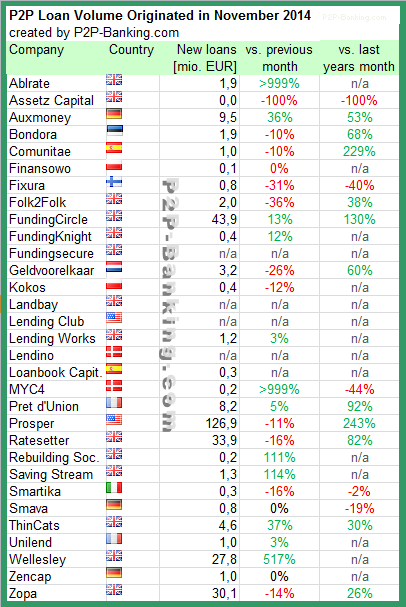 November was a month of mixed results for the listed p2p lending services. Some grew, some had a small decline in newly originated loan volume this month. Ratesetter crossed a total volume of 400 million GBP originated since inception. Ablrate profited from the deal with the first institutional investor, which boosted volume. I added one more service. I do monitor development of p2p lending figures for many markets. Since I already have most of the data on file I can publish statistics on the monthly loan originations for selected p2p lending services. Note that volumes have been converted from local currency to Euro for the sake of comparison. Some figures are estimates/approximations. If you want to be included in this chart in future, please email the following figures on the first working day of a month: total loan volume originated since inception, loan volume originated in previous month, number of loans originated in previous month, average nominal interest rate of loans originated in previous month. Lending Club Valuation at IPO 4.33B Max. Interesting how the growth in origination differs even in annual figures. Guessing we’ll see an increase, at least on American sites, over the next few months as media attention on the Lending Club IPO brings borrowers to the platforms.